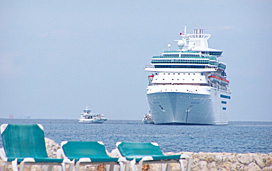 (1:45 p.m. EDT) -- Royal Caribbean's Majesty of the Seas is in an unexpected dry dock, prompting the cancellation of the ship's next cruise, which was slated to depart Monday. Royal Caribbrean spokeswoman Cynthia Martinez says repairs will "resolve an issue that is causing a small amount of bio-friendly oil to leak." The ship, currently the oldest in the line's fleet, will finish its current sailing in Miami tomorrow, as scheduled. It will then sail to Freeport, where repair work will be completed. Passengers booked on the subsequent sailing -- a four-night Bahamas cruise from Miami, scheduled to depart April 27 -- will receive full refunds, as well as future cruise certificates equal to 100 percent of the cruise fares paid for the canceled voyage. Martinez did not specify how long the repairs will take or whether further sailings are expected to be impacted.